One of the more interesting developments that has come about during our 30 + years in the industry has been the application of our technology to various indoor air problems. The first big insight was the Dewatering Process, the ability of mitigation systems to control indoor humidity. 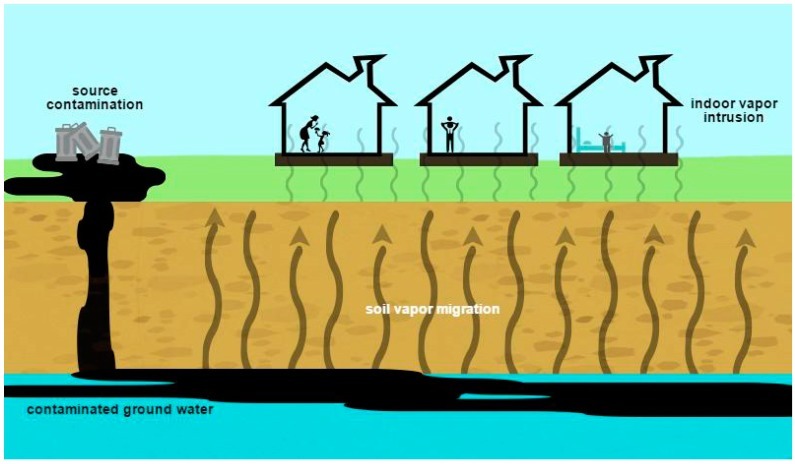 Later it became apparent that the mitigation system also had the ability to control Vapor Intrusion, that is the ability of virtually the same mitigation techniques to control Volatile Organic Compound in the soil from invading the living envelope. The term VOC stands for volatile organic compounds. It is a category of pollutants and toxic vapors some of which occur naturally in the soil such as methane gas and other decaying organic materials trapped in the soil. Others are the remnants of various industrial processes. Benzene and Petroleum Hydrocarbons are often found in soil around old gas tanks and oil spills. Various solvents like Tetrachloroethene, used in dry cleaning, and Xylene, another hydrocarbon, used widely in the rubber, leather, and printing industries. These solvents can infiltrate buildings through cracks and like Radon move by diffusion relatively porous concrete. There are also many airborne compounds and substances which can reduce indoor air quality. They include things like air fresheners, oven cleaners, new carpet and the fresh paint out gas and diminish over time. One of the most common household VOCs is benzene, a carcinogenic gas found in cigarette smoke. Although there are many different types of VOCs, there is one commonality: VOCs cause long-term health problems for those who live with prolonged exposure. VOC’s can also be naturally occurring, such as those from mold and fungi–which are responsible for the highest allergen levels of any naturally occurring VOCs. As you might expect, VOC concentration tends to be much higher indoors, especially in buildings which have poor ventilation. Sick Building Syndrome typically used to describe an office building where the workers seem to be chronically sick with something. The most common complaints are headaches, irritation to the eyes, nose and throat, and a general malaise. Such ailments can be caused by toxic soil vapors infiltrating buildings and an unhealthy accumulation of indoor pollutants due to poor ventilation. Unlike radon, which has no immediately identifiable characteristics, many VOCs are noticeable by foul smells or through the allergic or asthmatic reactions they trigger in many individuals. While the long-term health effects of VOC exposure are difficult to study, there is compelling evidence linking some VOCs to an increased risk of leukemia and lymphoma.